By John B. Berg Jr. The reason I decided to write this article was in part because of a incident that happened a few years ago. During a round of golf one day I got into a conversation with a man named Don Mc Curry of Rock Hill S.C. He had served with the 82nd Airborne during WWII from D-Day, Nijmegen, to the Eagles Nest, and the wars end. In the course of the conversation I mentioned that I was trying to find out some information about my father who was also in WWII. Don being a history teacher after the war and priding himself on his knowledge of WWII said he might be able to help. He asked some of the places my dad fought in and I mentioned the Huertgen Forest. Don said he was very well aware of the battle and that he had even been in the forest some time after the battle had ended. Don then asked what outfit my father was with. I told him the 8th Division 28th Regiment, the Golden Arrow Division. Don told me I was probable confused with the Bloody Bucket 28th Division and that he had never heard of the Golden Arrow Division. I felt I was right and Don said he would get back to me. A few days later Don called me and said he would like to talk with me so we had lunch together. He apologized and said he found the 8th Division in his collection of books and that in his opinion they fought extremely well in the Huertgen. His next comment astounded me. He asked when my Yankee father (I´m from New Jersey) would be visiting and that he wanted to meet him and shake his hand. I was stunned but regretfully informed him that my father was deceased. I asked why he would want to shake my father´s hand. Don started to tell me about the absolutely horrible conditions of the Huertgen and that in his opinion it was the toughest campaign of the European Theater. This from a man who was involved in D-Day, a certified hero and a veteran from beginning to end. In my research I found that what Don had told me is completely true. I even talked to men from the 28th Division, they did not recognize the 8th Division, and the 8th relieved them at the Huertgen forest! I finally have enough information collected to make an attempt to give some recognition to the 8th Division. We have all read about, seen movies of and documentaries on our well-known WWII infantry divisions. The 82nd, 101st Airborne, the 1st, 4th, 9th,10th, and 29th Infantry Divisions, and Ranger forces. They have received a tremendous amount of exposure and praise, all of it well deserved and probable not enough. They are the known heroes of well-known divisions. I would like to expound about one of the lesser-known divisions / regiments of the U.S. Army. The 8th Infantry Division (Golden Arrow) was composed of the 13th, 28th, and 121st Regiments. They entered Europe on July 4, 1944 and fought to its end. The major campaigns they fought in were the battle of Normandy, Brest, Northern France, Hurtgen Forest, Rhineland and Central European Campaigns. As a division the 8th had almost 3,000 killed and over 10,000 wounded in action. They also had three medal of honor winners, two with the 13th and one with the 121st. The 28th Regiment is credited with the capture of over 115,000 prisoners of war, the division with over 314,000. I’ve extracted a 21-day period from the 28th Regiment’s 2nd Battalion diary, 2nd Battalion S3 reports, and the morning reports of E Company 28th Regiment. The 21 days cover the 22nd of November through the 13th of December 1944 in the Huertgen Forest Germany. The 8th Division (Golden Arrow) relieved the 28th Division (Bloody Bucket) which was almost wiped out in the previous weeks of combat in the forest. The only difference for these two divisions is that the 28th Division fought in the cold rain and the 8th Division got the snow and sleet. During the battle of the Hurtgen Forest there were no other major campaigns going on so the Germans could concentrate on keeping the Americans from advancing to the Roer River. Any advance at this point in time would have disrupted the German plans for the Battle of the Bulge. Another advantage (besides the increased incentive of defending the Fatherland) was the West Wall defenses, which passed through the Hurtgen Forest area. This meant that the Germans had well fortified bunkers, well camouflaged with crossing lines of fire protecting adjacent bunkers with barbed wire and anti-personnel mines in front of the bunkers. The whole forest was heavily mined. 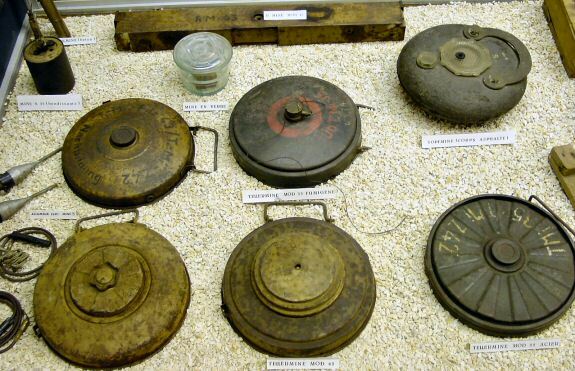 Anti-personnel and anti-tank mines were placed along roads, ditches, and any other avenue of approach. Additionally the area on top of the ridges, including Vossenack were open with no cover. The slopes of the ravines were heavily wooded so that artillery and mortar fire caused tree bursts that rained sharp wood splinters as well as shrapnel down on the men below. This made the conventional foxhole useless. They needed logs and dirt covering them if they were to provide any protection at all. Vossenack and the open fields around it were at a lower elevation than the areas occupied by the Germans. This gave the Germans excellent observation to direct mortar and artillery fire on the Americans. Divisional and Regimental orders called for primarily frontal assaults by the American Infantry. This left no room for maneuvering. The divisions and its regiments were spread out so far that only small unit attacks could be mounted and any breakthrough that was achieved could not be exploited. Replacements were sent in as individuals as opposed to squads, platoons, or companies that had trained together and knew one another. The poor replacement frequently did not know where he was or who the guy next to him was, and these guys’ lives depended on each other. The kindest way you could describe theses tactics against well prepared and dug in defenses such as these is very bad strategy. The descriptions I’ve heard from the men involved are not printable.